Is it time to make the switch from the Flex to the Flex 2? Fitbit began its fitness tracker journey with clip-on trackers like the Ultra and the One, but its first wrist device, the Fitbit Flex, was a major turning point for the company. It led to several other wearables including the Charge 2, Alta HR and its successor the Fitbit Flex 2. There's obviously been some upgrades on the original along with a new design, but the question is for Flex owners is whether there's actually enough to let go of their current tracker love. Read this: Which Fitbit fitness tracker is best for you? The two Flex bands aren't that different in terms of their simple design. The original Flex has a tracker with LEDs that light up when tapped to show your goal progress. The tracker module can also be removed for cleaning or if you want to switch out bands. It's water resistant but not waterproof – so safe for showers and dishwashing but not swimming. The Flex 2, however, is the company's first swim-proof tracker and is capable of being dunked up to 50m. There's also a removable module with the second Flex, again for cleaning and in case you want to change bands. Just like the first Flex, you can choose from several different elastomer colours or metal necklaces that can house the tracker. These come in handy if you want a more sophisticated look in the office or during a night out. There's no changing out Flex for Flex 2 bands though, since the sequel is 30% smaller and sleeker. The different form factor makes Flex 2 feel even lighter and less obtrusive on the wrist. There's also a different clasping mechanism that makes putting it on and taking it off easier than the first device. 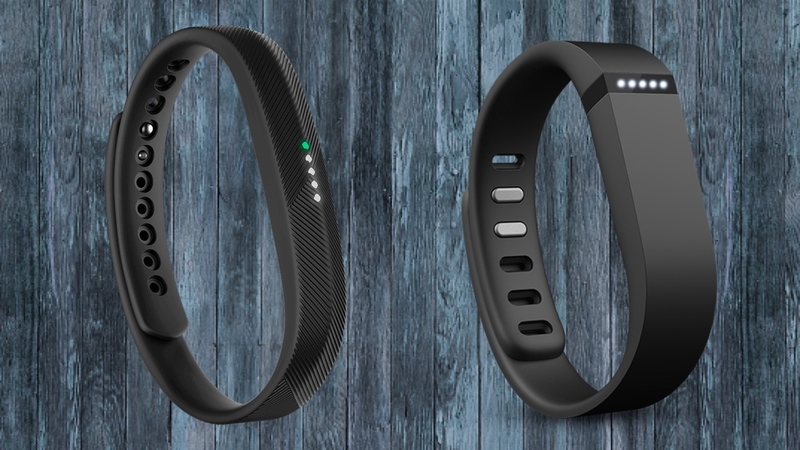 While the Flex was seen as a solidly designed tracker – minus the annoying clasp – the newer version is an all-round upgrade in terms of looks, comfort and function. Using the built-in accelerometer, the Flex can monitor steps taken, distance travelled and calories burned, track sleep and see how many minutes in the day you've been active. Flex 2 can do all this and more. Fitbit's SmartTrack feature also comes into play here. Currently, the exercises that can be auto-tracked on Flex 2 include walking, running, outdoor bike rides on pavement, elliptical, aerobic workouts (Zumba or cardio kickboxing) and sports like tennis, basketball and soccer. The first Flex doesn't have SmartTrack automatic exercise recognition support. As mentioned, the Flex sequel is waterproof and capable of swim tracking in the pool. Duration and laps of the following four strokes are auto tracked: freestyle, breaststroke, backstroke and butterfly. You can then head to the app to see your metrics. Pool length can be changed to more accurately track your laps as well. Neither device packs the advanced features of the Blaze, Alta HR or Charge 2 – there's no heart rate monitoring, VO2 Max or GPS syncing. But those devices are aimed at a slightly different group of people who take fitness a tad more seriously. And it's worth noting that neither the Charge 2 nor the Blaze are swim-proof. Fitbit Flex has five indicator lights that flash various patterns, but that's about it. Flex can't receive and notify you of incoming calls, texts or anything else. You also have to tap the front of the tracker to see your goal progress. Each solid light represents a 20% increment toward that goal. For example, if your goal is 10,000 steps, three solid lights means you're approximately 60% of the way there and you've taken about 6,000 steps. The Flex vibrates and flashes when you've reached your daily target. Flex 2 has a similar design with LED lights, but it's an updated version with different colours that signify different notifications. Calls and texts both get blue lights but the haptics are different for each; yellow is for silent alarms and magenta is a reminder to move. Tapping it will show the green and a series of white lights to indicate daily goal progress. It's a simple system on each fitness tracker but Flex 2 does provide a bit more. There's no screen for notifications (like you'd find on Fitbit Alta), but Flex 2 is smaller, even more discreet and gets the job done. Depending on how you use the Flex, you'll get between five and seven days of use on a single charge. That's not so different from Flex 2. It's not bad compared to wearables with displays but not great when you stack it up against other fitness trackers without screens. Turning off alarms and call/text notifications will give you more time with the Flex 2 – around nine days from our testing. But you're likely stuck with five days for Flex since there's nothing but the alarms to shut off. In terms of pricing, the Fitbit Flex 2 costs $59.95 while the original Fitbit Flex is now $39.95. If you're searching for the one of the most affordable fitness trackers around, Fitbit Flex 2 is one of the top wearables you can get, especially if you're not looking for the frills that come with its brethren. It's also one of the best waterproof fitness trackers you can pick up right now as well. The Flex is cheaper and even simpler but the extra cash for the sequel does go a long way – and you'll still be leaving the display and extra notifications behind. On top of the upgraded auto-tracking features, the design is slimmer and easier to clasp, plus it's the only Fitbit that's truly swim-proof. Between the two devices, the clear winner is the Flex 2.